Development of the Next Statewide Historic Preservation Plan is Underway! The Office of Historic Preservation (OHP) is in the process of developing the next Statewide Historic Preservation Plan (State Plan), to cover the years 2018-2022. Preparation of a State Plan is required by the National Park Service every five years as a condition of the grant each state receives from the federal Historic Preservation Fund. Per NPS requirements, the State Plan must involve a significant public input process and the plan must include: A summary of the planning process, a clear statement describing the planning cycle, a summary assessment of historic and cultural resources, a vision for historic preservation, goals and objectives, and a bibliography. Beginning in November 2016 and continuing well into 2017, the public input process involved an online survey as well as public listening sessions held throughout the state and online. OHP staff also conducted one-on-one interviews with specific individuals. All of the input gathered from the public will now serve to inform the process of setting goals and objectives to be outlined in the new State Plan, as well as contributing to the Plan's overall discussion of historic preservation challenges, opportunities, and directions in the next five years. The result will be a meaningful and actionable Statewide Historic Preservation Plan created by and for Californians dedicated to preserving our state's treasured heritage! Check back on this page and subscribe to our email list to receive the latest updates as the State Plan renewal process moves forward. Scroll down further on this page to download a copy of the current State Plan and review the goals and activities outlined in its chapters. More information about State Plan requirements can be found at the National Park Service website. The vision, goals and objectives outlined in the State Plan can’t possibly be achieved by one agency, such as the Office of Historic Preservation, acting alone, or even a few operating in concert. Rather, it will take the concerted efforts of many individuals and organizations. With that in mind, we thought it would be useful to provide ideas for how you can help support the State Plan based on the “hats” you wear in your life. Below is a list of categories of people--some are traditional preservation partners, and others are not. You probably fit into many of these lists. By using the link for each category, you will be taken to a page with specific activities that you could do in support of the State Plan. For those of you in the preservation community, these lists are made up of the suggested activities included in the State Plan. As you can see from these lists, there are lots of activities to choose from. If we all took on just one or two of these suggestions each, it would go a long way toward achieving the vision put forward in the plan. Thank you for your help in making this vision a reality. Local or Regional Government Employee, Elected Official, or Commissioner? State or Federal Agency Employee, Elected Official or Commissioner? Historic Site Employee or Volunteer? Teacher or Youth Group Leader? You can also see the activities that apply to the Office of Historic Preservation. Each State Historic Preservation Office is required to review and revise the State Plan every five years as a condition for receiving a grant from the federal Historic Preservation Fund. Information about Statewide Historic Preservation Planning is available online from the National Park Service. 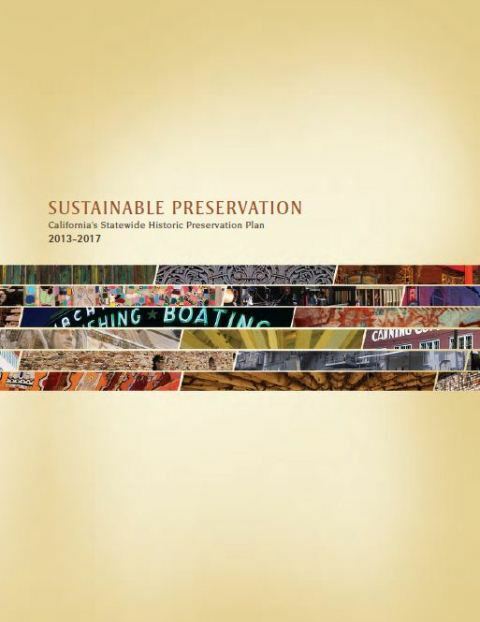 Identifies preservation partners and their contributions needed to accomplish the State Plan’s goals and objectives. Over the last 20 years or so, the scope of historic preservation planning practice has expanded beyond being concerned primarily with understanding the nature and significance of historic and cultural resources to integrating historic preservation into the broader land use planning and decision-making processes, and incorporating historic preservation into other social and economic concerns such as sustainability, revitalization and community development, affordable housing, disaster preparedness planning and recovery, and environmental quality. Statewide focus on preservation issues and players all across the state. Active public involvement, not only in developing the vision, issues, and goals of the plan, but also in helping achieve these goals. A series of public listening sessions in a variety of locations, an online survey, interviews with key individuals, focus groups with selected people involved in preservation in the state, and posting information and engaging discussion about the plan on our Facebook page, and through Twitter are some of the ways in which the public is included in the process. Consideration of a wide variety of social, economic, political, legal, and environmental conditions, issues, and trends affecting resource preservation. Consideration of the full range of historic and cultural resources representing the breadth and depth of the state's history, prehistory, and culture. Coordination with other planning efforts in the state, such as federally mandated transportation planning, the statewide comprehensive outdoor recreation plan, and local land-use plans. Linkage of preservation plan implementation with the Office of Historic Preservation’s expenditures of its federal Historic Preservation Fund grant. Per the direction contained in the State Plan, the Office of Historic Preservation has prepared a statement of annual goals for the 2016-2017 federal fiscal year, which includes a list of projects and activities the office will undertake this year in support of the State Plan. To find out more about the State Plan process call us at 916 445-7000, or email us at calshpo@parks.ca.gov. To view the Archaeological White Papers (documents developed by the State Historical Resources Commission Archaeological Resources Subcommittee with public consultation) which are a part of the current State Plan, visit the White Papers page.